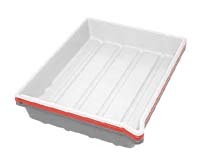 Paterson print processing trays for 11" x 14" prints in white, red and grey. Oversize trays provide extra room for print agitation. The trays feature reinforced edges for strength and rigidity, a molded-in thermometer well and pouring lip. Four channels in the bottom of the tray make it easy to pick up prints. The trays have outside dimensions of 19¾"L x 15"W x 3½"H. These trays are used and have cosmetic blemishes from previous use, but are certified to be in perfect working condition.